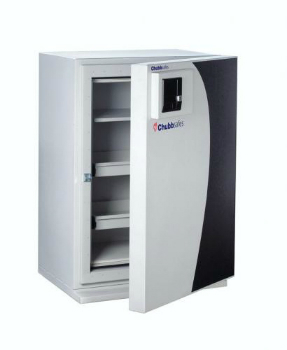 The Chubb Data Guard NT Data Cabinets are quality built to ensure the protection of data and media. Available in four sizes, all cabinets protect valuables for up to 120minutes from fire as standard. Maximum internal capacity and 60% more storage space than other safes due to its single door feature. Full fire protection without the need to be locked thanks to the user-friendly, slam-action door. For more information and additional help when choosing a data cabinet, call one of our friendly security experts on 0117 9674994.